When this cowl meets wrap started showing up in my Instagram feed, I began to get notes and emails from the knitters among you asking for more details. As I've mentioned, my mom has taken up knitting after about a 30 year break, and I'm lucky to be on the receiving end of many of her current projects. I've been wanting a wrap like this one for a long time. I pinned several possibilities from Etsy shops and tried to crochet one for myself (which is sitting unfinished in the yarn project basket hiding behind my couch as I type this). When my mom found a pattern that she thought she could adapt for this kind of look, I said a big "YES!" And now I'm hoping she'll make me two or three more. I asked her to share some more details about the pattern and yarn for those of you who knit (keep in mind she mentions making it a bit bigger for me because I wanted to truly wear it as a wrap and I'm curvy). In her note below, she also mentions where she bought those little flower pins I've been wearing with my headbands (shown in this post). 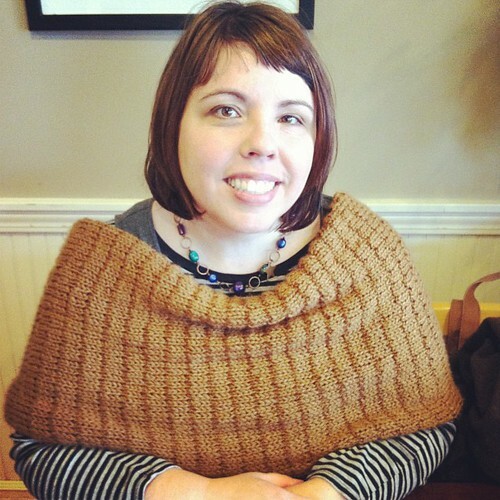 The wrap is based on the Ella Textured Cowl designed by Rosemary Drysdale, a free pattern from Tahki Stacy Charles, Inc. I simply increased the size in width (in three stitch increments to keep the pattern) and length and used an 8 needle (rather than the 7 in the pattern to increase the stretch). This wrap (cowl) is not knitted in the round - it is seamed once the desired length is reached. For your shoulder wrap I added the three inches in length (again stopping at an appropriate place to keep the pattern) so it would comfortably reach around your shoulders. I used Tahki yarn: Savoy, in the cinnamon color which is color 17. This is an Italian yarn with a great 'feel' when knitting as it is 52% silk and 48% Merino wool. After seeing a completed cowl done in red Savoy at Nan's Needleworks (in Horseshoe Bay, Texas), I purchased the Savoy yarn there and received the pattern at the same time. Additionally you have asked about the flower pins you've been wearing with your headbands. I purchased the alpaca flower pins and Ellie's hand embroidered alpaca poncho at Rainbow's End Alpacas in Norway, Michigan. All of these items were handmade in Peru of Peruvian Alpaca. I hope this answers the questions. can you choose love today?